I am glad that many ppls are requesting magicians gloves, yeah we need this item badly and I am sure we get it sooner or later, just hope it wont take too long. I also request executioner shoes for GX! (2) Enable the use of “Maximize Power” Lv1. 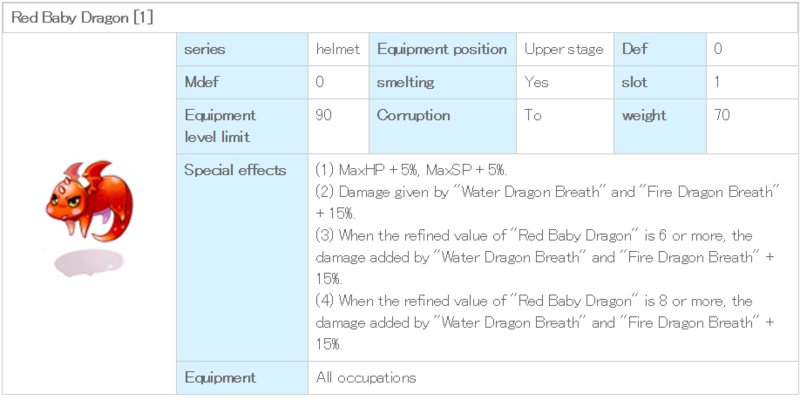 (3) Reduces SP consumption of “Meteor Assault” by 8. (4) If refine level is +5 or higher, adds MaxHP+7%, MaxSP+7%, every 1 base level up increases “Meteor Assault”’s damage by 1%. (5) If refine level is +7 or higher, adds MaxHP+10%, MaxSP+10%, every 1 base level up increases “Meteor Assault”'s damage by 1%. 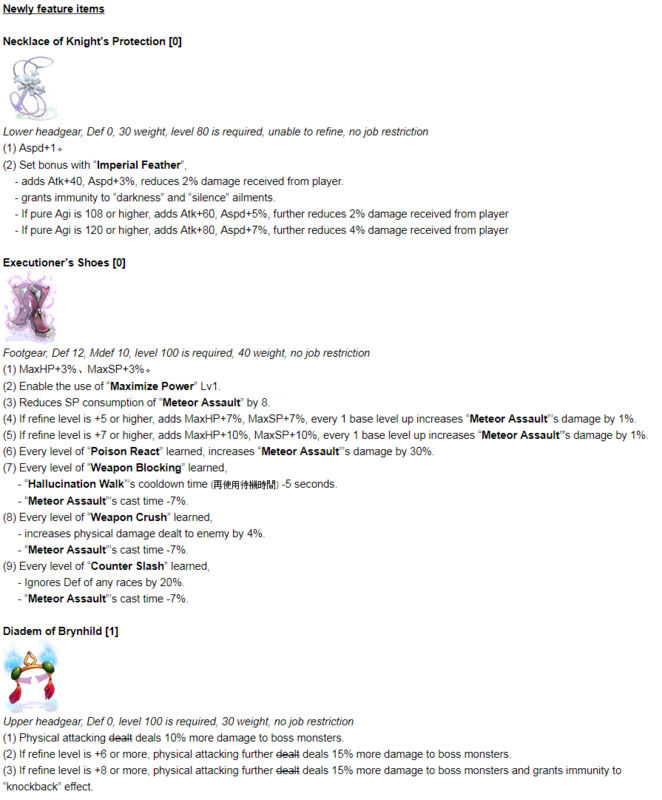 (6) Every level of “Poison React” learned, increases “Meteor Assault”’s damage by 30%. - “Hallucination Walk”’s cooldown time (再使用待機時間) -5 seconds. - “Meteor Assault”’s cast time -7%. - increases physical damage dealt to enemy by 4%. - Ignores Def of any races by 20%. This is what people want now it seems. Edited by ShinobiEX3, 14 June 2017 - 12:27 PM. Giant set for cart termination boost too, would be nice. Edited by VModCinnamon, 15 June 2017 - 03:28 AM. And OCP itens enable to be enchantable, please, as they are on jRO. Edited by Ethanasael, 26 June 2017 - 11:03 AM. That knight's necklace needs to have all of it's numbers divided by 10. 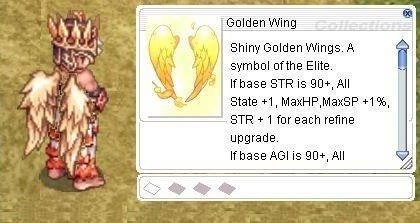 Golden Wing stats doesn't work in thor. It has no effect but has a slot. Edited by Svoike, 11 July 2017 - 11:15 PM. (4)The damage of cart revolution increases 1% per 1 Base Lv. (5)The damage of cart cannon increases 2% per 20 Base Lv. (6)The damage of cart tornado increases 2% per 30 Base Lv. Edited by kira26, 16 July 2017 - 10:24 PM. (1) If refine level is +7 or higher, “Arrow Vulcan” inflicts 150% more damage. Edited by HeresNatan, 08 August 2017 - 03:02 AM.